pg 72 Carrot 'noodles' with avocado dressing. This was just so easy but delicious. You may need to have on hand a gadget called a spiraliser to get the full effect of this dish. But there are various models around that you can find to suit your pocket. The dressing was easy to whip up but I wouldn't say it was pouring consistency at all -more of a thick dip really. Still, I used it as it was and the whole dish came together beautifully and was super tasty. Great way to get veggies into kids too. Don't miss out the tamari toasted seeds either. Adds another texture to the overall dish. pg 65 Cucumber and Tempeh Salad I have made this twice now and it was my first introduction to Tempeh. Delicious asian flavours bring this salad together with its simplest of ingredients. The hardest thing, or rather the bit that takes the longest is the frying the tempeh cubes ...but this is easy. Great for vegans, gluten and or the dairy free too. 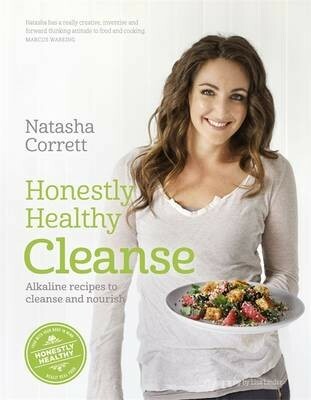 Honestly Healthy Cleanse is a cookbook for food-lovers who want to look and feel fabulous. In a world full of processed and sugar-dense food, gourmet vegetarian chef Natasha Corrett has created 4 cleansing recipe plans suitable for every occasion to help get you back on track. From a nurturing weekend of juices, smoothies and soups to a 6-day slimdown, and from a high protein cleanse if you're exercising hard to a 28-day plan to permanently change the way you eat, the book is packed full of deliciously healthy food. With over 100 recipes following alkaline eating principles Honestly Healthy Cleanse is for anyone looking for cookery ideas and inspiration. And you don't even need to religiously follow the plans themselves to feel the benefits - simply cook and eat any of the dishes in the book and you'll be nourishing your body naturally. #feelgood - 3 days of smoothies, juices, teas and soups which allows your body to have a rest from digesting over a weekend, to help draw out the toxins naturally. #slimdown - whether it is for a party, holiday or special event this 6-day cleanse will leave you feeling a few pounds lighter and glowing with health. #highenergy - if you want to tone up and cleanse at the same time this 6-day solution you have plenty of energy for high impact workouts like HIIT and cardio. #lifechanging - you can change the way you live your life to feel and look better in just 30 days, with delicious healthy recipes for a lifetime of good eating.